By Hongkiat Lim in WordPress. Updated on February 28, 2016 . Disclaimer: This post is brought to you by Elegant Themes. Here’s the thing: your own website is subjected to the same vicious itch as any other. I’m sure your content is high-quality and the design is impeccable. But let’s face it, opt-in forms are the virtual salesmen that everyone hates. On the other hand, they’re also the best way to collect e-mails, stay in touch with your audience, and grow a strong community organically. So how can you stand out from the crowd and make sure your audience doesn’t miss the chance to hear from you again just because you’re the 123,897th person who asks for their e-mail address? The most surprising thing about successful opt-in forms is that they’re as subtle as they can be. Their design is beautiful, but not too flashy, and they’re so perfectly integrated into the website that they don’t interrupt users from their activity. In other words, they stand out… but they don’t POP! At least not in the classic way. This is the most important feature of an opt-in form and that’s exactly what you should be going for, as well. But don’t worry, there’s no need to reinvent the wheel here and get busy creating a new way of collecting e-mails that may or may not catch on. There’s a new opt-in plugin that has already fixed every problem that made opt-ins insufferable so far. 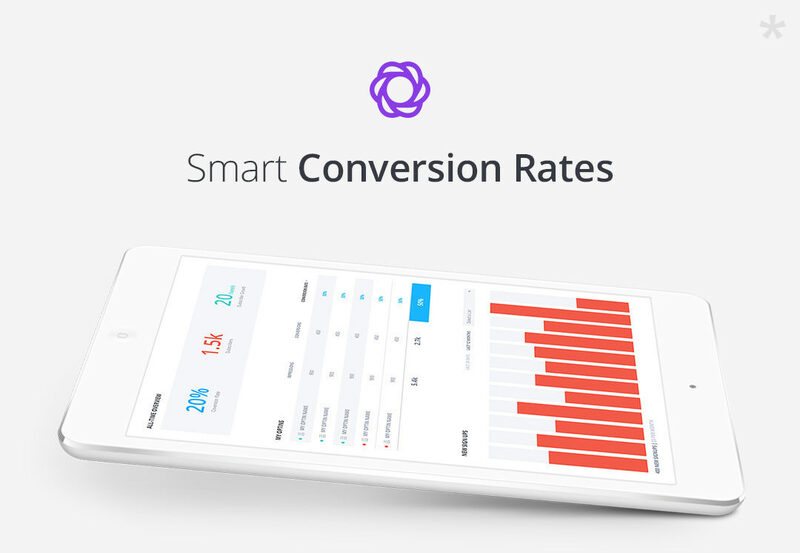 It’s called Bloom and it doesn’t just make these forms more attractive to the visitors on your website, it also makes it easier for you to manage your e-mail lists and measure the success of your opt-in campaigns. Unlike most plugins, Bloom offers you the possibility to position the forms where you want them, and choose what triggers them to appear on screen. You have a bunch of tools at your disposal, all very simple and intuitive, that help you customize the perfect opt-in for your website. 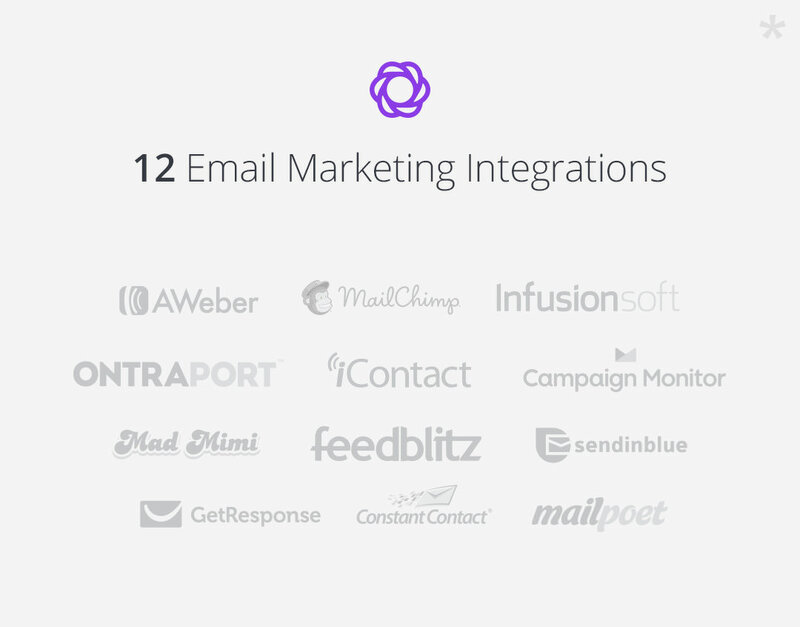 There are 12 e-mail marketing integrations, 6 e-mail opt-in types, and the freedom to personalize forms for a wide range of contexts. And to make it as easy as possible, Bloom comes with a friendly dashboard that allows you to manage all these features without getting a headache. Bloom is designed to do everything for you in a smooth and time-saving manner, so you can create beautiful, perfectly-timed opt-ins that integrate on any website page and complement your content. This alone stands as proof that the visitors on your website will love it as much as you will. Just as the dashboard is designed to save you time and brain cells by making the process of creating and managing opt-ins a piece of cake, it also brings users closer to you with non-intrusive, appealing opt-in forms that add value to your website instead of discrediting it. This way, you show your occasional visitors that you understand how they like to consume online content (and by that I mean “uninterrupted”) and win their trust more easily. Instead of poking their eyes out with an inappropriate opt-in, you draw their attention with a well-placed form only when they’re ready to accept it. Before you can create a functioning opt-in form on your website using Bloom, you first need to connect the plugin to your email marketing software. 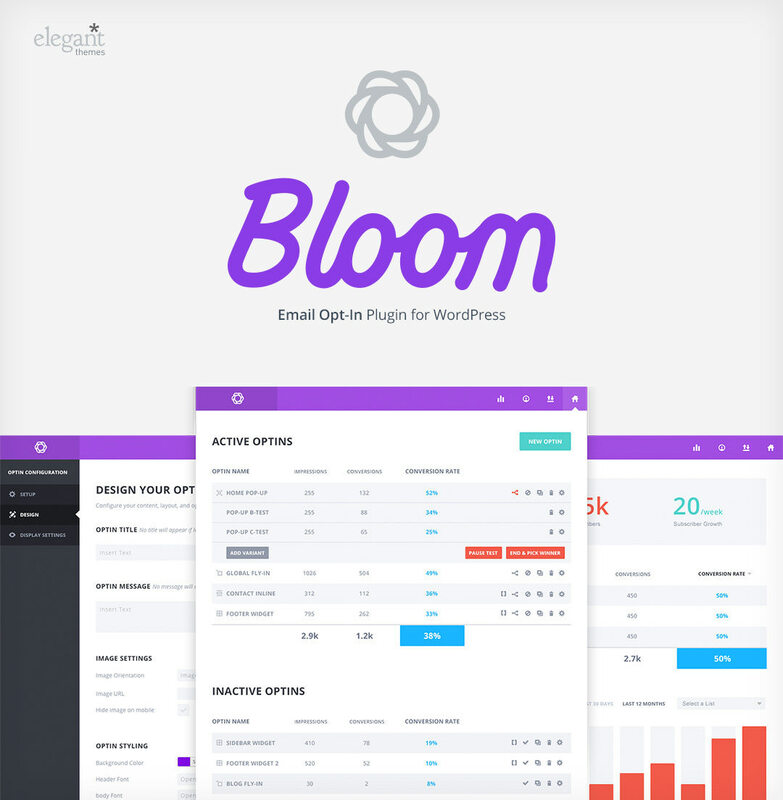 Bloom works with several different systems, such as MailChimp, Constant Contact, MadMinim, iContact, InfusioSoft, Feedblitz, Aweber, Campaign Monitor, GetResponse, SendInBlue, MailPoet and Ontraport. Once you’ve done this, you can start working on your opt-in forms by using the tools available on Bloom. 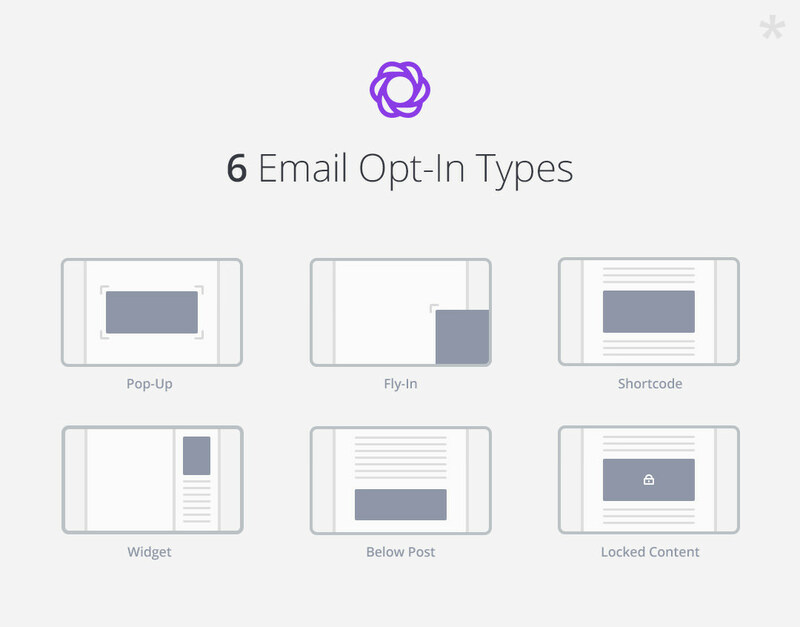 You have 6 e-mails opt-in types and a set of fully customizable forms to choose from, allowing you to adjust just about every aspect of your opt-in, from titles and body copy, to image positioning, borders, form styling and set-up, and even custom CSS tweaks for individual forms. 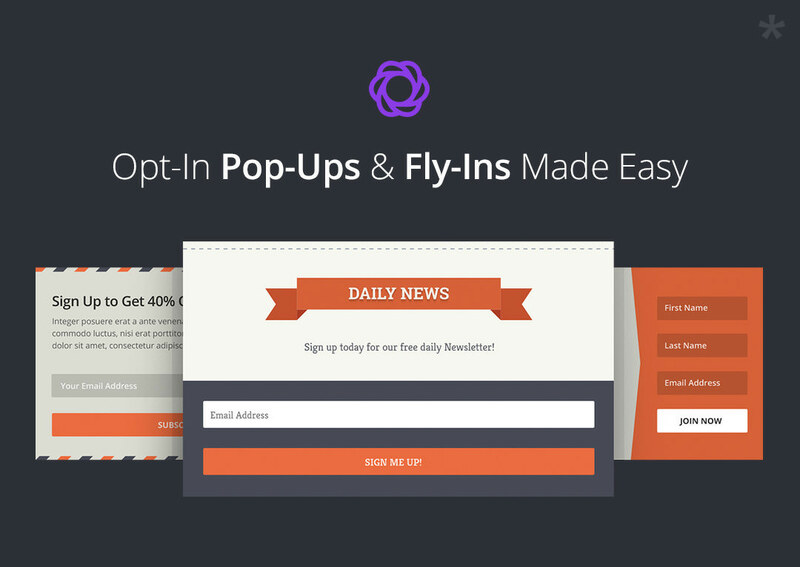 Whether you create a Pop-Up, Fly-In or Below Post, you also get to choose what triggers your opt-in. It can be the user’s inactivity on your website for a certain amount of time or the user’s comment on an article. You can time the opt-in to appear when the visitor gets to the bottom of the page or while scrolling, and you can even put locked-in content on your website that users can unlock only after subscribing. If you’re not sure which type of opt-in works best, you can perform split tests (A/B tests) to see what attracts users most and pick the highest performing variation to be your main version. Whatever you choose to do, you can rest assured you won’t have a hard time managing the plugin. You have short video tutorials to help you figure things out in just a few minutes. That’s all you need to start designing beautiful, non-intrusive opt-in forms that will help you grow your e-mail lists and create a powerful dialogue. You can start using Bloom today to understand the needs of your audience and build a strong, long-lasting bond. Download the plugin now and customize all your opt-in forms to integrate perfectly into your website and you’ll will be able to create the loyal community you’ve been longing for.